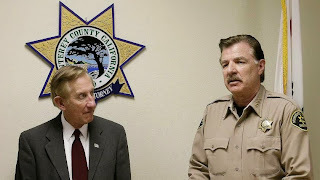 Monterey County District attorney Dean Flippo, left, and Monterey County Sheriff Scott Miller address a news conference, on Tuesday, Feb. 25, 2014, in Salinas, Calif. Six county officers, including the recently retired police chief and the acting chief, have been arrested in connection with a scheme to steal more than 200 cars from poor Hispanic people. Who could do such a thing? From poor Hispanic people? Tow shop owner Brian Miller, his brother acting police chief Bruce Miller and Sgt. Bobby Carillo were scheduled to be arraigned Monday on bribery charges after authorities said vehicles impounded from Hispanic immigrants were funneled to the tow yard then sold or given away. Prosecutors said an undetermined number of vehicles were sold or given away for free when the owners couldn't pay fees to reclaim them. Two people at Miller's Towing in King City refused comment. 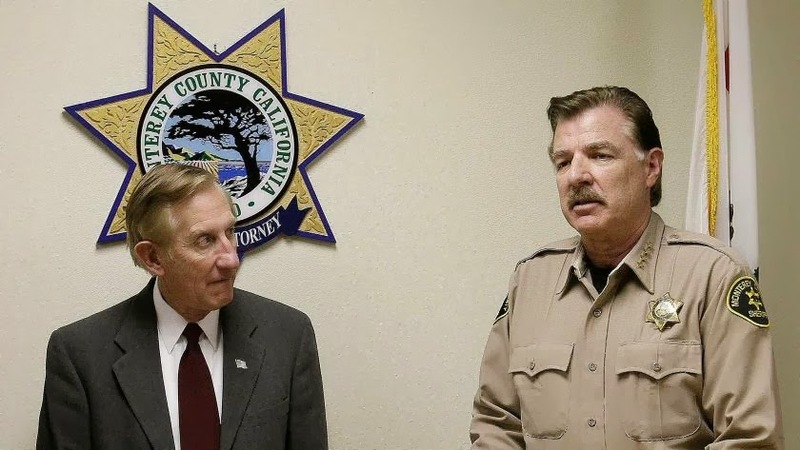 Hopefully, when the old, white District Attorney Flippo and Sheriff Miller are retired in the next couple of months, a younger, dynamic breed of law enforcement will take the reins in Salinas and enforce the rule of law. You're at your very best when you make posts like this. Keep it up.